Licensee to Colonial Williamsburg, Historic Deerfield and Old Sturbridge Village. 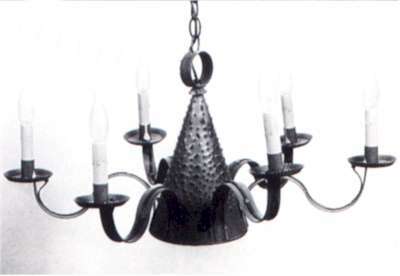 Sheldon-Hawks House North Parlor Chandelier. 19 1/2"W x 22" H. Antique Cherry with Gold Banding. Available in four or six arm models. 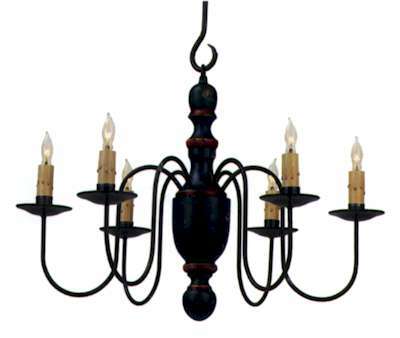 Wrought Iron Chandelier. 22"H x 24"W. Available in natural finish or painted. Optional hollow "S" hook instead of chain. Turned Wood Chandelier. 15"H x 21"W. Available in any color combinations, with drip sleeves. Optional hollow "S" hook instead of chain. Visit their website. Culvert Top Lanterns. 5" x 6" x 13", 6" x 7" x 18", 7" x 8" x 22", 8" x 9" x 25". Five finish option to chose from. 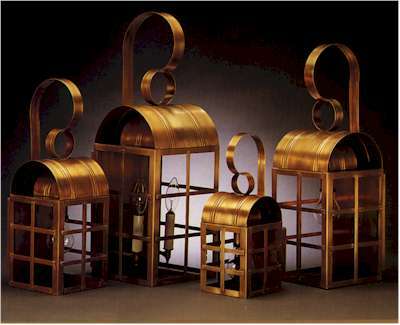 Exterior Post Lantern. 15" x 15" x 43". 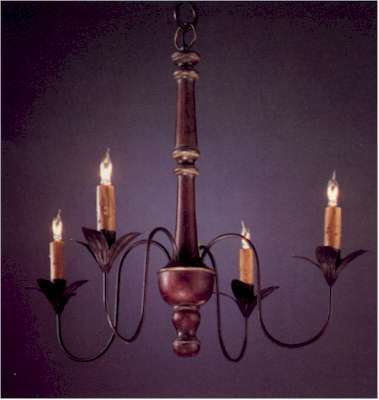 Available with medium base socket and chimney (as shown) or a three light candelabra cluster. Five finish options to chose from. Visit their website. 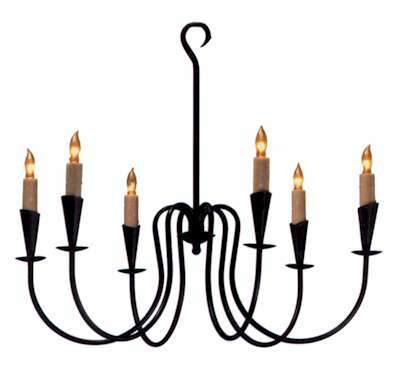 Six light Witches Hat Chandelier with down light and optional 3-way switch. 13"x26" Available in antique tin, antique brass or pewter finishes. 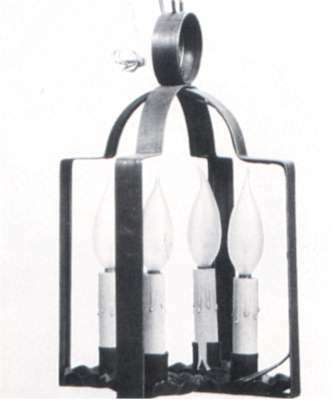 Four light Hall Fixture. 13" x 9" Available in antique tin, antique brass or pewter finishes. The Woodwright Co. offers a variety of styles and sizes of lampposts in solid Western Cedar with a PVC base-nothing to rot.